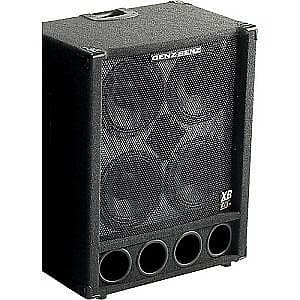 This enhanced 4x10" produces incredible dynamic response for a single enclosure. Usable frequencies down to 35 Hz with tight, articulate mid-transients and snappy highs. The most popular of our XB2 cabinets, the GB 410T-XB2 is a formidable rig by itself or with multiple cabinets. Power Rating: 700 watts RMS. Components: Four GXB-1040 woofers, one GBE 4410 4" tweeter and one GBE 3560 4K Hz 18db crossover. Available in 8 ohms standard or 4 ohms optional. This enhanced 4x10 "Produces incredible dynamic response for a single enclosure. Usable frequencies down to 35 Hz with tight, articulate mid-transients and snappy highs. The most popular of our XB2 cabinets, the GB 410T-XB2 is a formidable rig by itself or with multiple cabinets. Power Rating: 700 watts RMS. Components: Four GXB-1040 woofers, one GBE 4410 4 "tweeters and one 4K GBE 3560 Hz crossover 18db. Available in 8 ohms standard or 4 ohms optional. 31 "x 25" x 16 "